I don't care if Odell Beckham Jr. scores another NFL touchdown this year while wearing the rapper Drake's OVO cleats. I don't care if Stephen Curry gets along with Kevin Durant this NBA season. And I really don't care what Lebron James thinks about Hillary Clinton and the election. What I do care about deeply is the story, or lack thereof on why there is so little black wealth in America, and the decadent veil being used to disguise its nonexistence. #Blackwealthmatters, I have written extensively on the subject on sites from Inequality.org and beyond. Today we stand at a place where African Americans own little if any of America's land, produce little if any of the country's resources and possess negligible amounts of this nation's immense wealth. This is all while they still project aspiration based on a blind faith in the American Dream. We see the effect of the fallout from Chicago to Baltimore, as the police march into rioting black communities starved of resources. Yet no one is talking about the state of black life as the economic catastrophe which it has become in a substantively consistent way. We're not hearing anything from President Barack Obama, not the Congressional Black Caucus, and definitely neither Clinton nor Trump. Not even black families themselves are dealing with the financial realities of these times. It is as if there is a belief all this economic tragedy can exist, and black Americans can still buy homes, pay off student loans and save for retirement, despite all the current data showing otherwise. As an example, the National Association of Real Estate Broker's 2016 report, "The State of Housing in Black America" recently stated, that the current home ownership rate for blacks is at a twenty year low of 41.7 percent. To give that rate context, it is lower than the national home ownership rate was during the Great Depression of the 1930s. In fact, when you deduct the family car and other depreciating assets from their worth of the total 14.5 million African American homes, half of all black American households accounting for over 7 million families of three, have a total net worth of less than $1,700. While the net worth of the median white family remains near $100,000 using the same method of accounting. Yet African Americans dream on. Even the white poor have more money than most black families. Princeton University sociologist Dalton Conley has found that even white families living near the poverty line have a net worth exceeding $10,000. Going even further into the data, a recent study by the Institute for Policy Studies (IPS) and the Corporation For Economic Development (CFED) found that it would take 228 years for the average black family to amass the same level of wealth the average white family holds today in 2016. All while white families create even more wealth over those same two hundred years. In fact, this is a gap that will never close if America stays on its current economic path. According to the Institute on Assets and Social Policy, for each dollar of increase in average income an African American household saw from 1984 - 2009 just $0.69 in additional wealth was generated, compared with the same dollar in increased income creating an additional $5.19 in wealth for a similarly situated white household. "The matrix which is hey, as African Americans, primarily we do not have access to a real education. You do not have access to jobs. You do not have access to opportunity. We do not have access to capital that is not predatory. So what does that leave you? It leaves you with... economic genocide." I agree, and believe a large part of the reason we can't get honest is a decadent veil of black celebrity has been used to mask the massive amount of black poverty. African Americans have increasingly come to base their view of the current economic state of black America on the reflections of Jay Z's purchase of Tidal for 56 million dollars, rather than the millions of black American families that as a whole lost by some reports half of their wealth over the last several years. For a generation of blacks, celebrity exceptionalism and its results has been confused with the economic progress, or the lack thereof that has been achieved by the black race as a whole since the days of the Civil Rights Movement. This approach has come to create an escape for far too many, one where vision boards on bedroom walls filled with quotes of overcoming odds from wealthy African American celebrities, proves more important than their very own real economic struggles of the moment. Recent research, based on matching declared income on tax returns with corporate compensation records, allows me to state that the vast majority (60 to 70 percent, depending on what definitions one chooses) of the top 0.1 percent of the income hierarchy in 2000-2010 consists of top managers. By comparison, athletes, actors, and artists of all kinds make up less than 5 percent of this group. In this sense, the new US inequality has much more to do with the advent of "supermanagers" than with that of "superstars." Bloomberg recently gave a racial framework to the information above by reporting that only 1% of the S&P 500 CEOs are black, with African Americans making up a mere 2.6% of those holding posts within striking distance of becoming next to head one of these major companies. White males and white females collectively hold nearly 90% of these top spots, which, according to Piketty are the type of supermanager positions that are making most of the money in America. Just last week Forbes released its annual Forbes 400 report on the richest people in the U.S., focusing in on the top 25 people on The 2016 Forbes 400, they are all white, and have a combined net worth of over 900 billion dollars. That is over 37% of the total 2.4 trillion dollars in wealth held by all 400 members on the elite list. Together, this data makes clear white supermanagers, and white capital holders are making most, if not nearly all of the American held wealth being earned in the U.S. today. Wealth in America is not diverse, in fact, it is really white. This remains true no matter how many times we are shown Lebron James in his mansion in feel good commercials. 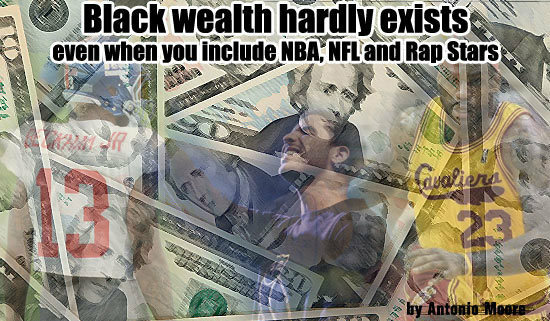 Because for every singular sports phenom like Lebron James playing basketball, there is not just a Bill Gates controlling computers, there are countless white wealth holders making money that black Americans are locked out of accessing. The great irony being that whites also make up the bulk of the 5% of entertainers in the top .1% of earners Piketty refers to as well. 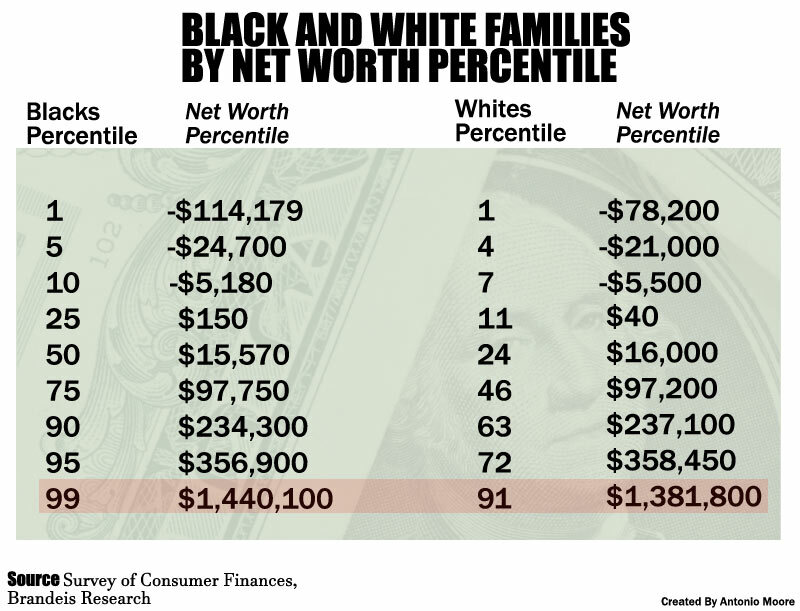 Looking at this even more specifically, a set of data recently released by the Survey of Consumer Finances and Brandeis Research showed counting all their assets less than 1% of black families have over 1.4 million dollars in net worth. This is contrasted with nearly 10% of white families holding the same amount of wealth. Using this data as a guide in raw numbers well over 8 million white homes are millionaires, while less than a few hundred thousand black families can claim the same million-dollar status. 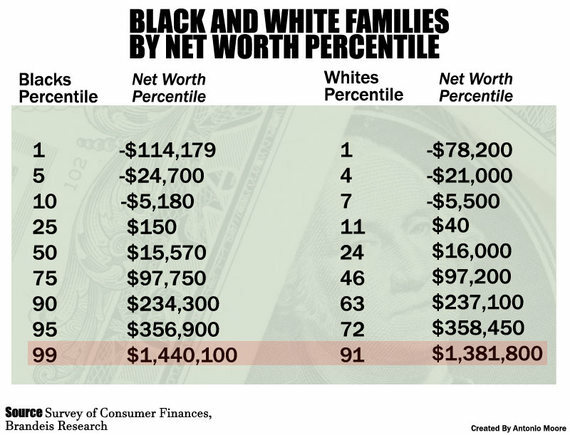 In addition, a mere several thousand black families can claim they are within the top 1% of earners. We now live in a time where the five largest white landowners in America, own more agricultural land than all of black America, with all white families together owning 98% of the land, worth nearly 97 percent of the value. We are in a period where as reported by Demos.org, the top ten percent of white homes own nearly everything, with the next tier of white households holding most of the remaining wealth. In fact, the 2.4 trillion dollars of wealth in the accounts of the few people on The Forbes 400 list is more wealth than that in the possession of all 41 million black Americans combined. This is the truth about the amount of wealth held by the progeny of American slavery. The summation is that while blacks live in the wealthiest country the world has known, despite the displaying of a few wealthy black celebrities most African Americans have little if any personal wealth to show for it. Antonio Moore, an attorney based in Los Angeles, is one of the producers of the Emmy-nominated documentary Freeway: Crack in the System. He has contributed pieces to the Grio, Huffington Post, and Inequality.org on the topics of race, mass incarceration and economics.